An elaborate Christmas lights display covers the property of Quick Response on Route 9 in Clifton Park December 8, 2015. Holiday lovers across the region can look forward to the continuation of a sparkling and bright holiday tradition in southern Saratoga County, thanks to Quick Response Restoration. The Round Lake company, which specializes in fire damage repair and restoration, is entering its 18th year of hosting its popular and free holiday-themed light show. The lights display is usually turned on after Thanksgiving and is kept on through New Year’s Day, said Noelle Long of Quick Response. Each year, Quick Response hosts the “Hometown Heroes” light show on Nov. 30 for first and emergency responders, and a community-wide event on Dec. 7 and 8. The light show started as a small affair that stemmed from founder and Chief Executive Officer Vince Laurenzo’s love of Christmas, Long said. 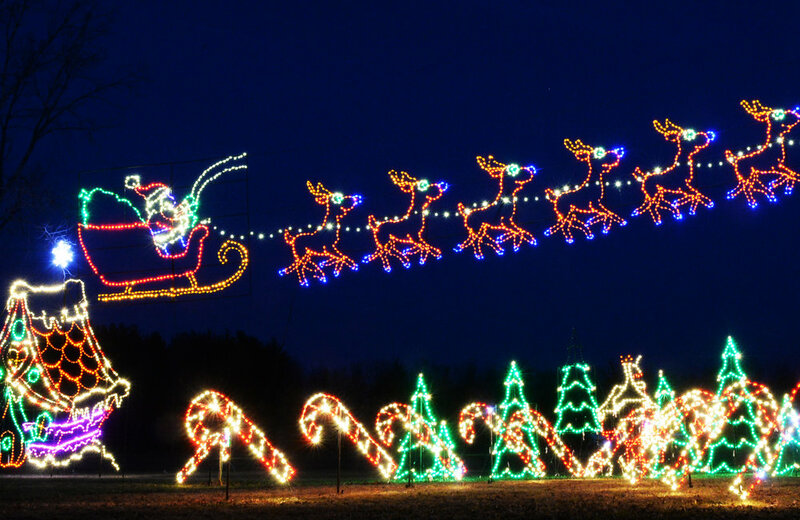 Slowly but surely, Laurenzo began to build up his inventory of light displays and, with the help of staff members and volunteers, the lights show became a large-scale event that sees over 8,000 visitors each year. The company has invested in expanding the event over the last few years. Last year, the light display was expanded further down Route 9. Quick Response has since purchased a carousel that was previously owned by the Catskill Game Farm, offers rides through the lights pulled by Clydesdale horses and on a wooden train pulled through the site by tractors, and brings in tried and true children's’ favorites to hand out balloons, including Scooby Doo and Tigger. There is also a tent with cookies on site, on-site handicap parking, and off-site parking at Corpus Christi Catholic Church for events from which people can take shuttle buses to the light display a short distance up Route 9. Other organizations in the nearby community have contributed their help and time to the Quick Response lights display as well. Large volumes of nightly traffic has been the most significant hurdle to overcome as the event has grown, Long said. “Traffic control is one of the biggest problems we’re facing right now,” Long said. To combat traffic backups, the Town of Clifton Park provides traffic cones to the company to use on the site, and the Jonesville Fire Department parks a truck on site with flashing lights to help drivers navigate. Officers from the Saratoga County Sheriff’s Office also attend the event to keep the night flowing smoothly and intercede as needed. Over the years, Long said, the company has added new lights to the display fairly spontaneously, without any concerted plan from year to year. But people often come back year by year to revisit their favorite displays, and even bring their own children to see the lights years after they’ve grown up.